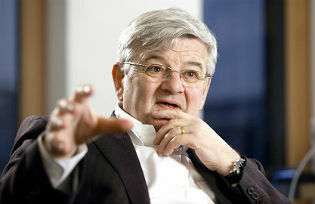 Joschka Fischer, German Foreign Minister and Vice Chancellor from 1998-2005, on the leadership crisis facing Europe, the possible disintegration of the Union and the need for a solidarity-based solution to the debt crisis. BERLIN – Just weeks ago, the worst of the financial crisis in Europe seemed to be over. Stability seemed to be returning. But appearances proved to be deceptive. A minor problem (at least in scale) like Cyprus, when combined with an almost unbelievable degree of incompetence among the “troika” (the European Commission, the European Central Bank, and the International Monetary Fund), was enough to turn a molehill into a mountainous crisis. While markets remained calm, the Cyprus crisis revealed the full extent of the political disaster that the eurozone crisis has wrought: the European Union is disintegrating at its core. Europeans’ current crisis of confidence concerning Europe is far more dangerous than renewed market anxiety, because it cannot be overcome with another liquidity injection by the ECB. Europe’s old political order was based on competition, mistrust, power rivalries, and, ultimately, war among sovereign states. It collapsed on May 8, 1945, and was replaced by a system based on mutual trust, solidarity, the rule of law, and compromise. But, with the crisis eroding these foundations, trust is giving way to mistrust, solidarity is succumbing to ancient prejudices (and even new hatred between the poor south and the rich north), and compromise is being overwhelmed by diktat. And Germany is once again at the center of the process of disintegration. That is because Germany, by far the EU’s strongest economy, has enforced a strategy for overcoming the eurozone crisis that worked for Germany at the beginning of the millennium, but under completely different internal and external economic conditions. For the distressed southern European states, the German-backed mixture of austerity and structural reforms is proving fatal, because the decisive third and fourth components – debt relief and growth – are missing. It is only a matter of time before one of the large European crisis countries elects a political leadership that no longer accepts the austerity diktats. Even now, come election time, national governments more or less openly promise to protect their citizens from Europe, because Germany has seen to it that austerity and structural reforms take pride of place in managing the crisis. The argument that “tough love” was necessary in southern Europe, because nothing there would ever have changed otherwise, has been settled. The love has been very tough indeed, generating rapid economic contraction, massive unemployment (upwards of 50% among young people), and continued fiscal deterioration, owing to rising debt-service costs. Indeed, all eurozone members are now experiencing weak economic growth, if not recession. What does Germany want? A German Europe would never work, and the country’s political class lacks both the courage and the determination to pursue a European Germany. So, does Germany want to hold together the monetary union and thus preserve the EU, or will it allow dithering and a lack of vision to hasten the erosion of Europe’s foundations? In this crisis, intention takes a back seat to action (or lack thereof). The International Herald Tribune recently quoted Winston Churchill: “It’s not enough that we do our best; sometimes we have to do what’s required.” That is precisely the order of the day in Europe and the eurozone. Europe’s national politicians routinely criticize the EU for its lack of democratic legitimacy, yet they bear part of the responsibility for it. Or have pro-Europeans become so faint-hearted and dejected that they prefer simply to hand over the reins to anti-European populists and nationalists? That would be a disaster, because the crisis now runs too deep to be resolved by technocratic means. Germany is preparing for a national election in which – much like in last year’s French presidential election – the European crisis is to play no part, or at least only a minor one. Both government and opposition believe that it would be better to tell the people the truth concerning the most vital question of the day only after the election (and in measured doses). Such an outcome would make a mockery of democracy. But things may turn out very differently if the dynamics of Europe’s crisis throw German politicians’ plans into disarray. An unpleasant surprise cannot be ruled out; at this point, it might be Europe’s greatest source of hope.